Now that we are officially in November, it seems like the Holiday season is knocking on our door. Stores have begun their holiday displays and Christmas tunes are coming out of your radio. At FineStationery.com, we have been working for months to prepare a perfectly curated collection of holiday products so that you can find exactly what you're looking for on our site. This week, we bring you the debut of a featured designer, Lady Gatsby. This design house pumps out colorful and vibrant watercolor artwork. 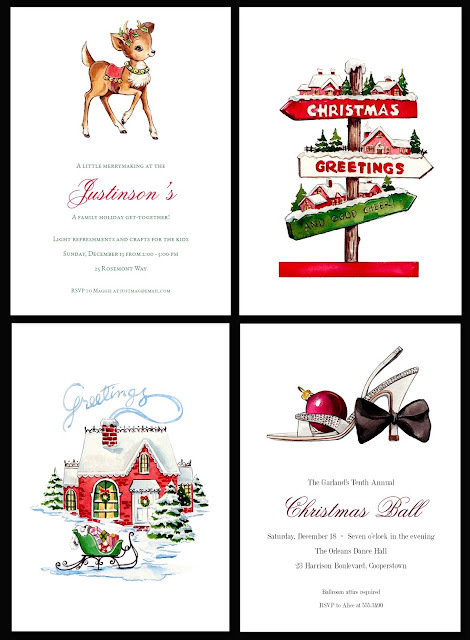 From designer shoes to trimmed Christmas trees, this collection has something for everyone. We took some time to get to know the creative mind behind the designs and found out how a bachelorette party led to a successful career and how she likes to spruce up her home for the holidays. Q : What sparked your interest in the Stationery industry? A : I commonly found that my girlfriends had a difficult time finding the “card” or “perfect invitation” as most of what is available is very traditional. We were always looking for cards and invitations that were fun, fashionable, and representative of ourselves. Little did I know that in planning one of my friends bachelorette party, I would stumble upon a do-it-yourself project that would spin out of control. I never intended to start a stationery business – it just kind of grew organically, I love fashion, so I decided to try to fill a void in the market and combine my illustration skills with my love of fashion, and launch a stylish paper goods company that appealed to us fashionistas. So here I am on an unexpected, but definitely welcomed journey. Q : What makes your designs stand out from the crowd? A : I love creating designs by hand and my favorite is traditional watercolor. My designs stand out because, I’ve added a twist on traditional by making the designs rich in color. Q : Where do you look to find inspiration for your artwork? A : Fashion magazines, my friends and currently using Pinterest to learn what's trending. Q : What is your favorite part about the Holiday season? A : I love the family gatherings, it’s the best time to reconnect since most of us live in different parts of the world. Q : Favorite Holiday song? A : Please don’t ask me to sing it, but my favorite holiday song is Silent night, Holy Night. Q : Favorite decoration to make your home feel like the Holidays? A : I love to spruce up our home-sweet-home during the holidays with the ol’ faithful Christmas Tree. Below, take a quick peek of our favorites from this whimsical collection. Shop the products individually or take a look at the whole collection to find exactly what you're looking for. For a limited time, now through November 8th, get 15% off any order up to $150.00 or 20% off orders $150.00 and above! Use code HOLLY to save. Promotion ends on 11/08/2015 at midnight EST. Discount must be used in a single transaction, cannot be combined with other offers. Discount may be suspended or terminated at any time and may be subject to product restrictions or exclusions.